Della Notte Ristorante is a Italian, Continental, and Catering restaurant where most Menuism users came for a romantic date, paid more than $50, and tipped more than 18%. An Italian chowhound from Ashburn, VA tried it, liked it, and rated it . They liked the food, liked the service, and liked the ambiance. A dining patron from Owings Mills, MD tried it, liked it, and rated it . They liked the food, liked the service, and liked the ambiance. An Italian chowhound from Elkridge, MD tried it. 3 reviews of Della Notte Ristorante, first by CirceBaltimore. This classy restaurant will remind you of days gone by when excellent service and exquisite food were the norm, not the exception. The pate appetizer on polenta was light and flavorful, the Bermuda triangle of a filet, lobster tail, and veal was lovely to look at and even better to eat, and the apple cobbler with warm caramel sauce was so good that we ate the extra caramel sauce with a spoon! My husband raved about the tender venison chops on risotto, and they were nice enough to substitute for the brussel sprouts baby green beans which he prefers. The diner’s pleasure comes first here. The service was professional and unobtrusive. This restaurant, out in the scenic Sparks countryside, is a true gem, especially for a romantic & special meal. The Bermuda triangle is composed of a tender filet of beef with Bearnaise sauce, a veal scallop with a cheesy sauce, and a lobster tail with real melted, drawn butter. It came with a loaded Jack Tar potato taken out of the skin and piped onto the plate, seasoned green beans, two whole sauteed carrots, and carved pieces of green and yellow squash. 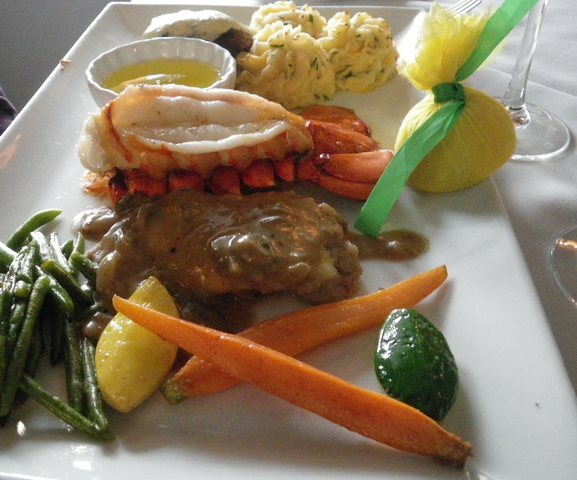 The filet was rare as ordered, the lobster tail was not overcooked or tough, and the veal was delicious although I am not really a fan of sauces with cheese in them. This is a beautiful circular restaurant with marble busts and a large tree in the middle of the restaurant. The food at Della Notte is visually appealing as well as palate-pleasing. They bring a dish of different olives and homemade foccacia when you sit down. 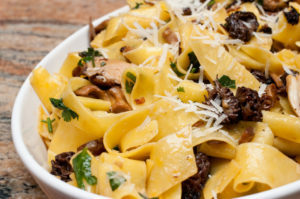 We have eaten there numerous times, and the menu always includes a variety of new appetizer and entree specialties as well as their delicious standard dishes like roast lamb and veal with wonderful wine reductions and pasta with seafood and savory sauces. Last night three of us ate there and had appetizers of artichokes stuffed with a mushroom and bread stuffing, ravioli w/cheese and chokes in a red pepper & creme sauce, entrees of lamb w/caponata and orichette with sausage, and desserts of Italian cheesecake, tiramisu, and coffee gelato, a special. Everything we had was superb including the homemade Sangria with lots of raspberries & other fruits in it. The dessert menu is very varied and includes crème brulee, gelatos, sorbets, tiramisu & zabaglione. My husband and I always enjoy the spaciousness and lack of crowding in this beautifully appointed restaurant with soft music playing in the background and prompt, polite servers. They even pick you up & drop you off at the theater, symphony, etc., if you are going there. Also, they have their own parking lot which is a boon in downtown Baltimore since there is no available parking on the street at night so you usually have to pay for expensive garage or lot parking. Lamb cooked medium rare, tender and juicy, with pine nuts on top and wine reduction, surrounded by lots of eggplant caponata. Absolutely delicious!!! These dishes from the Della Notte Ristorante menu are contributed by Menuism users directly, as part of a restaurant review, or as part of a photo upload. A Seafood chowhound from Richmond, VA tried Koco's Pub in Beverly Hills. A diner from Nottingham, MD tried Casa Mia's. A dining patron from US tried Yummys Carry Out in Druid Heights. A Chinese food lover from US tried Hunan Wok. A Pizza food lover from Baltimore, MD tried Johnny Rad's Pizzeria Tavern in Canton, liked it, and rated it . They liked the food, liked the service, and liked the ambiance. A Chinese chowhound from Parkville, MD tried New Han Dynasty Chinese Restaurant and didn't like it. A Soul Food chowhound from Baltimore, MD tried Soul Kuisine Cafe in Greenmount West, liked it, and rated it . They liked the food, liked the service, and liked the ambiance. A diner from Baltimore, MD tried Kimmy's Restaurant & Carry Out in Risterstown Station. Do you own Della Notte Ristorante? Contact us to connect with your diners. Della Notte Ristorante is located near the cities of East Case, Fells Point, Canton, and Morrell Park. People found this by searching for: Delanote Restaurant Baltimore, Della Notte Restaurant, Della Notte Menu Baltimore, Dellanote Baltimore, Delanote Baltimore, Della Notte Restaurant Baltimore, Della Notte Menu, Della Notte Ristorante Menu, and Della Notte Baltimore.